I am privileged to speak to a number of different people from many walks of life in my work and find it interesting to hear that when asked how they are, so many respond as busy! Busy-ness has become almost a way of life with the rush of modern living, work schedules, family life and social commitments bringing about the feeling that one day simply blurs into the next at a great speed. The overwhelm of this fast pace has led to a rise in the popularity of the meditation practice called mindfulness, which focuses on being aware of the present moment. 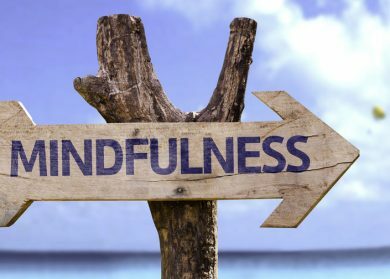 Mindfulness encourages us to notice what is happening only in the moment that we are in, rather than lamenting about the past or thinking into the future. Take for example your morning shower. Did you notice how the water felt on your skin? The smell of the soap you were using? Or were you rehearsing your presentation for your morning meeting, already feeling like you were there? Next time you have a shower, see if you can pay attention to your senses and what you are feeling whilst you are there. 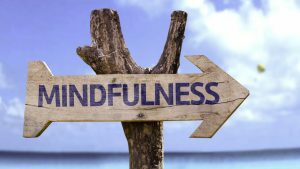 On paper, mindfulness can seem like such a simple concept but in reality it can be far from easy. That is why it is called a practice, and like most exercises the more you do it the better you get! One way to begin practicing mindfulness is to take a second to focus on something as simple as your breath. Feel the air as you breathe it in and notice it’s temperature. Notice the rise and fall of your chest. Pay attention to what it feels like as you breathe in and breathe out. This instantly brings you into focusing on the present moment, and you can tune in to your breath at any time of the day. You can practice mindfulness in any of your day to day tasks. When you are eating your meal really pay attention to how the food tastes, it’s aroma and it’s feel. When you are exercising notice the sensations in your muscles, your quickened breath, and the changes in your body. When you are cooking and stirring something on the stove try just stirring and focusing on that, rather than letting your mind wander onto the next thing. The more you practice mindfulness the more you will find you will be able to remain present throughout your day. The entire point is to help you to notice, enjoy and experience your life rather than have it all rush by. Jon Kabat Zinn, who is a renowned mindfulness teacher, sums it up well when he says “Remember – the real meditation is your life, and how you inhabit it moment by moment.”.